My third instrumental album of 2018 is out. The first volume of the “Wow & Flutter” series is a tribute to the synthesizer albums of the 70’s, specially the ones focused on cover versions. I chose tracks from 8 artists mostly from the 2000’s on to be reimagined with this retro and wonky sound. I had been working on this for years now. There was a major change of gear during the process. Different cassette decks were used to process and master the music. And on the final stages I even mixed some of them through cassette stems. I can’t thank enough Brenno Di Napoli, Andrio Barbosa and Carlos Ferreira for helping me on those. On the first day of posting it online I already got some nice feedback from North Atlantic Oscillations and Oceansize guys. It can be heard as Youtube and Soundcloud playlists. Local newspaper GauchaZH published a review about our neo-soundtrack for the 1931 Frankenstein movie. I had the chance of remixing the track "Electronic Geisha" by LA artist Kabiria. Carlos Ferreira helped me with some guitars and synths on this. Tive a oportunidade de fazer um remix da faixa "Electronic Geisha" para o Kabiria de Los Angeles. Carlos Ferreira me ajudou com algums guitarras e sitetizadores. This album is a collection of synthesizer pieces that serves as a homage and imaginary soundtrack to my favorite comic book run of all time: Alpha Flight 1-13, from 1980. I'd like to dedicate this to its creator John Byrne, whose influence on me as a creator of beautiful art is beyond measure. All tracks were composed, produced and mixed by myself earlier this year. I read each comic book issue from that run once again and created the tracks right on, one by one. I mastered it on a cassette tape to give it that proper retro sound. Este album é uma coleção de peças para sintetizador que servem como homenagem e trilha sonora imaginária para meinha sequência favorita de Hqs de todos os tempos: Alpha Flight 1-3, de 1980 (publicado no Brasil como "Tropa Alfa"). Eu gostaria de dedicar a obra ao criador da série, John Byrne, cuja influência como criador de bela arte não pode ser medida. Todas faixas foram compostas, produzidas e mixadas por mim em um breve período no começo do ano. Eu li cada uma das edições novamente, criando cada faixa logo após. Masterizei em uma fita K7 para obter aquele som retrô apropriado. Next tuesday I'll be doing a live soundtrack for the movie "Frankenstein" (1931) with Quarto sensorial for the Fantaspoa movie festival. There are plan for audio and video recording. Próxima terça eu me apresento ao lado do Quarto Sensorial fazendo uma trilha sonora ao vivo pro filme "Frankenstein" (1931) como parte da programação do Fantaspoa 2018. 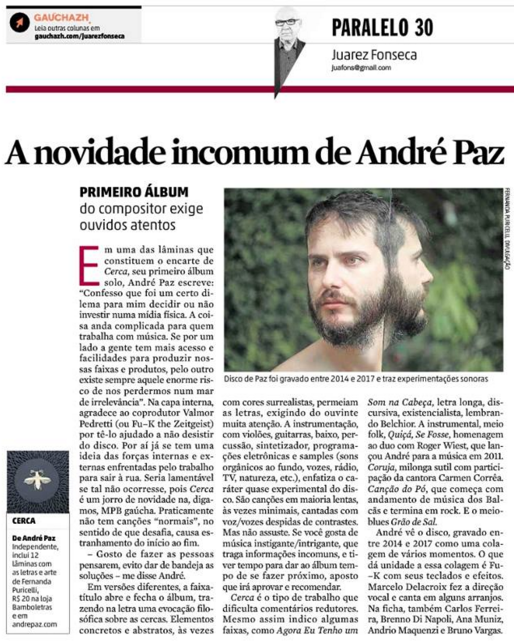 Porto Alegre major newspaper Zero Hora had a review of André Paz album "Cerca" last week! O jornal Zero Hora de Porto Alegre publicou uam resenha sobre o album "Cerca" do André Paz semana passada. So, while I work hard at the second FTZ record, I made a 1.5 album called "Library Music". it's made of instrumentals which were discarded tracks from other projects with new clothing or simple experiments. I plan on having this as a recurrent series of albuns. As usual, some amazing collaborators took part on this, most notably Carlos Ferreira (lots of beautiful guitars and synths), Brenno Di Napoli (killer basslines) and Paul Schreier (classy drumming). Lã, an artist whose album I produced in 2017, makes an appearance on the closing track. So far it's on Bandcamp only but I'll upload it to Youtube as separate tracks on the following days. Enquanto trabalho no segundo album FTZ, fiz um disco 1,5 chamado "Library Music". Composto basicamente de faixas abandonadas de outros projetos com nova roupagem ou simples experimentos. A ideia é ter este título como uma série. Como sempre, alguns colaboradores incríveis envolvidos. Em destaque Carlos Ferreira (guitarras e sintetizadores), Brenno Di Napoli (baixo) and Paul Schreier (bateria). O artista Lã, com quem trabalhei em 2017 no primeiro album, faz uma participação na faixa final. Por ora somente no Bandcamp, mas nos próximos dias subo as faixas no Youtube. My instrumental band URSO, for which I play drums besides producing is releasing its second album. It's simply named "Dois" and it shows the ways we tried to evolve our music since the 2014 debut album. We played these songs live for a long time before commiting them to hard drive, so the recording was done in Tungstudio with 3/4 of the group playing in the smae room under the metronome. Later Andrio added his guitars here at Coletivo 4'33" and we did a bit of overdubbing. Carlos Ferreira guested on two tracks. It can be downloaded for free at http://urso.bandcamp.com or streamed at Youtube. All music © Fu_k The Zeitgeist. 2017.